Nearly 600 pounds of marijuana was seized, and several people were arrested following a Monday traffic stop in Fairfield, Butler County Sheriff Richard Jones said. During a Wednesday morning press conference, Jones said the suspects transported the pot in a semitractor-trailer. The pot came from Mexico and was stashed and “hidden well” inside of the walls of the vehicle, investigators said. “It took them about six hours to get the dope out of the back of the tractor trailer and into the U-Haul. We sat there for six hours and watched,” said Tim Reagan, Resident Agent in Charge of the Cincinnati office of the DEA. The sheriff said the drugs came from Mexico, and the arrests stemmed from a month-long investigation. Six people were arrested, four in connection with the initial seizure and two in connection to a follow-up search warrant at a Cincinnati-area home. 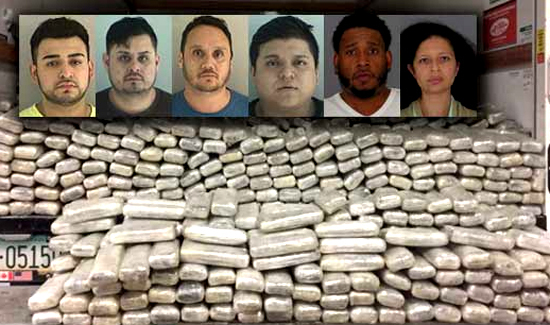 Jose Antonia Santiago-Razo, 32, Brandon Guijosa, 19, Miguel Alberto Trillo, 38, and Oscar Paz-Diaz, 20, were arrested, and each charged with possession and trafficking of drugs. They were found in possession of around 400 pounds of marijuana, officials said. Jones said one of the men had been deported twice in the past. “He was just deported in October. Probably no sooner than when we dropped him off that he was right back, probably within a week selling poison,”Jones said. The investigation led investigators to a home of Teneal Poole, a Cincinnati police dispatcher. Cincinnati police said they believe Poole was employed with the department for around 13 years. Officials said they found around 200 additional pounds of marijuana at the home. Poole was charged wtih possession of drugs and permitting drug abuse, and her boyfriend, Damian Gray, was charged with trafficking and possession of drugs. Handguns were also seized at the home. Multiple agencies assisted in the investigation, including Fairfield City police, Fairfield Township police, the Ohio State Highway Patrol, Norwood police and the Cincinnati Police Department.